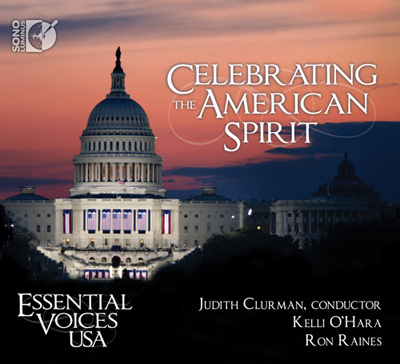 Celebrating the American Spirit, performed by Essential Voices USA (EVUSA) and conducted by Judith Clurman along with guest artists, Broadway stars Kelli O'Hara and Ron Raines and composer-arranger Larry Hochman, represents an American songbook for the 21st century. The centerpiece of this CD is Sing Out, Mr. President, a song cycle of sixteen newly commissioned compositions set to quotations by American presidents from Washington to Obama. Originally performed at the Library of Congress and broadcast on National Public Radio, the cycle showcases the American composers Samuel Adler, Milton Babbitt, Robert Bease, Jason Robert Brown, Thomas Cabaniss, Jake Heggie, Larry Hochman, Michael Gilbertson, Nora Kroll-Rosenbaum, Andrew Lippa, David Ludwig, Paul Moravec, Nico Muhly, Georgia Stitt, Zachary Wadsworth, and Jesse Wiener. The CD also includes individual new and newly arranged works by composers and writers such as Irving Berlin (It Gets Lonely In the White House and God Bless America), Leonard Bernstein (Take Care of This House), Sheldon Harnick (Reason to Be Thankful), Jennifer Higdon (A Quiet Moment), Larry Hochman (Two Paraphrases on American Anthems and American Dream) and Laurie Hochman (The Pledge of Allegiance and American Dream), David Ludwig (The New Colossus), Stephen Paulus (Hymn for America), Marc Shaiman (A Seed of Grain: Theme from The American President), and John Philip Sousa (Stars and Stripe Forever). Judith Clurman's abundant creativity and profound patriotism are on display throughout the CD in its model of American musical diversity, which represents a call for action and a reason for hope during a time of political crisis and conflict. Download the album's Press Release as a PDF (375k). Judith Clurman with Kelli O'Hara. Photo © Steve Sherman 2012. Used with permission.